Chris Grundler of the EPA: "The automakers agree that preserving the integrity of these fuel economy labels is a paramount concern." WASHINGTON -- Ford Motor Co. isn't the first automaker to backpedal on fuel economy claims. And it probably won't be the last. Car companies are competing fiercely to fill showrooms with the most fuel-efficient vehicles possible, knowing that a mile or two per gallon could make or break a new model. And in some cases the most potent solution for them lies within the arcane rules of federal fuel economy standards. Last week, when Ford slashed the fuel economy rating of the C-Max to placate regulators and angry customers, the company said it had based the original C-Max label on testing of the Fusion Hybrid, which uses the same powertrain but is more aerodynamic. Ford did nothing illegal, said Chris Grundler, head of the EPA's transportation office, in an interview. But its actions exposed a gaping regulatory hole that the EPA is now rushing to patch. These are just the latest maneuvers in an intensifying cat-and-mouse game in which automakers find ways to improve their miles-per-gallon numbers and regulators scramble to keep those numbers within the range of reality. The stakes are only growing as consumers face higher fuel prices and automakers look ahead to a 2025 deadline to meet stricter fuel economy standards. Last time it was Hyundai and Kia, which agreed in November to relabel most of their 2012 and 2013 models. The Kia Rio and the Hyundai Accent, Elantra and Veloster -- all billed as getting 40 mpg on the highway -- got new estimates of 36 to 38 mpg. The EPA says it will fix the provisions that led to the C-Max's inflated numbers, just as it expanded the audit program that snared Hyundai and Kia, to rebuild trust in its ratings. "The automakers agree that preserving the integrity of these fuel economy labels is a paramount concern," Grundler said. But history suggests that every time a loophole closes, another one opens. The Ford and Hyundai cases may be a deterrent for now, says Alec Gutierrez, a senior analyst at Kelley Blue Book, "but if you're in a jam, and your car's just not quite up to snuff? I wouldn't be surprised to see it happen a few more times." Under the EPA's test procedures, all car configurations with the same engine, transmission and weight class are grouped together. 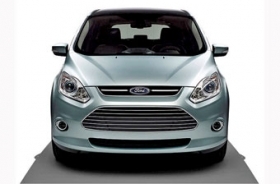 That is true even if they have different sheet metal, such as the Ford Focus sedan and Ford Focus hatchback, or they are entirely different nameplates, such as the Fusion and the C-Max. An automaker can test the best-selling car in the group and use the results for all configurations, a concession the EPA made long ago to spare car companies the expense of redundant testing. That's why Ford could use the Fusion Hybrid's rating -- 47 mpg city, highway and combined -- for the C-Max. "At worst, Ford is guilty of sticking their heads in the sand and claiming that they just followed the regulations," said John German, a fuel economy expert and former engineer at the EPA's vehicle laboratory. Critics see Ford's approach as a cynical play for marketing advantage. Toyota, whose Prius v was targeted in C-Max comparison commercials, tested that vehicle separately to calculate its rating of 44 mpg city/40 highway/42 combined. Toyota could have used the same label as the smaller Prius, with its 50 mpg combined, but didn't. Dave Sullivan, an analyst at AutoPacific Inc., said that while Ford's use of the Fusion number was legal, it wasn't right by customers. "They knew exactly what they were doing," Sullivan said in an interview. "They said: 'There's a loophole here -- let's use it.'" Ford's case is different from that of Hyundai, which violated the law by overstating its cars' performance on the "coast-down" test that measures the aerodynamics, powertrain friction and rolling resistance of a car. Government investigators are still looking into how that happened; Hyundai maintains that engineers in South Korea misjudged a complex test. It has been hard for the EPA to look over the industry's shoulder. The test requires a straight, flat two-mile-long track, and the EPA does not own one, so the agency has borrowed the runway of a military base in northern Michigan. Grundler said the EPA has also reassigned 30 staffers from the agency's technology program to testing and certification, to better keep an eye on fuel economy numbers. Roland Hwang, director of the Natural Resources Defense Council's transportation program, said the EPA needs to stay vigilant. "We are moving into a different world, with new technology and a stronger incentive for automakers to try to game the system," said Hwang, who sits on a panel advising the EPA on the new fuel-economy standards. "There's absolutely a lesson to be learned here." It's not just the regulators doing the policing. Ford and other automakers conduct regular tests of rivals' cars. In the summer of 2011, the automaker invited journalists to its proving grounds in Romeo, Mich., and asked them to drive the Elantra and the Ford Focus around the same track. The Focus averaged 40 mpg in those conditions; the Elantra didn't. Margo Oge, Grundler's predecessor at the EPA, said last year that the audits that snared Hyundai and Kia began after an executive from a U.S. automaker called her in 2010 to complain about "cheating" on the coast-down test. Chrysler denied tattling on Hyundai. A spokeswoman for GM wrote: "We don't conduct our business in that manner." "Ford routinely speaks with policymakers about a wide variety of issues affecting our industry," a Ford spokesman, Wes Sherwood, wrote in an e-mail at the time. "We have been -- and remain -- an advocate of driving real fuel economy gains because it is in the best interest of our customers."